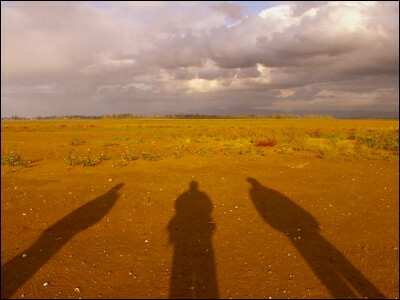 Shadows of three friends on the dry lakebed of Fern Ridge Reservoir near Veneta, Oregon. These photos were taken in October, 2005 while I was working on my story, Voices of the Rock People. The reservoir had been drained for a year while the Corps of Engineers repaired their dam, exposing the old landscape once called Grande Prairie, and the original watercourses of Coyote Creek and Long Tom River.